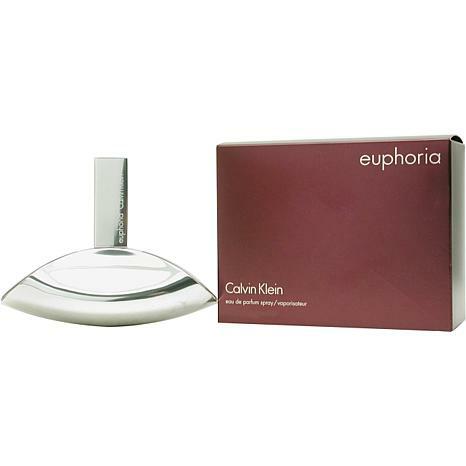 Launched by the design house of Calvin Klein in 2009, Euphoria Eau de Parfum Spray 3.4 oz is a womens fragrance that possesses a blend of Bergamot, Peach, Green Notes, Lotus, Orchid Euphoria is recommended for romantic use. This item may not ship to Alaska, Guam, Hawaii, Puerto Rico, or the Virgin Islands using a ground shipping method. Please select an air method when ordering this item for those locations. All Orders must also have a physical address and not a P.O. Box. Alcohol Denat., Fragrance Parfum-, Water -aqua-, Alphaisomeihyl Ionone, Benzyl Alcohol, Benzyl Benzoate, Benzyl Salicyiate, Butyl Methoxydibenzoyimethane, Butylphenyl Methylpropional, Citral, Citronellol, Coumarin, Ethylhexyl Methoxycinnamate, Ethylhexyl Cyiate, Geraniol, Hexyl Cinnamal, Hydroxycitronellal, Isoeugenol, nene, Unalool, Propylene Glycol, Tetrasodium Edta, Ext. Violet 2 450730-, Green 5 (ci 61570-, Red 33 (ci 17203-, Yellow 5 Ci 19140). A very soft, feminine fragrance that I love wearing. Was a bit skeptical at first but when it warmed on my skin....wow! Thank you CK, a mature scent without being frumpy. Smells great.. However, I don't think smell last too long.. I wear this every day, it's my go-to scent. People always say "you smell so good!". I don't know alot about perfume, I just know what I Like. I like scents that aren't too flowery, that are sensual. I love most Calvin Klein scents for that reason. I love it!!!! One of my favorite fragrances! I don't smell it but it stays on according to others. After my back surgery I was just cruising through HSN and decided I would like to try a new perfume. The one I currently am wearing I've been wearing since the era of time, lol but I still love it. Anywhoo, after reading up on Euphoria and other women's reviews on Euphoria, I thought I would try it. At first spray it's like a shock to the system, not used to something so intense! My usual 'go to' is more of a clean and fresh scent so it's more subtle. However, I walked around the house finishing getting ready and as I kept walking in and out of the smell of the Euphoria, I was falling more and more in love with it. It's like a romantic mix of smells that are not overwhelming, pomegranate, jasmine, musk maybe? But they all come together to create a smell like no other, and people will remember you for that, if you don't over do it. Another fan!